Thanks to my readers that donated to the crowdfunding campaign I’ve been able to force the US Mint through a Freedom Of Information Act (FOIA) request to hand over documents related to the physical audits of the US official gold reserves stored at the Mint; also referred to as Deep Storage gold. Although the PDF-package digitally sent to me is redacted, incomplete, includes pages copied twice and materials I didn’t ask for, it’s the closest thing that I’ve ever seen to physical audit documentation of gold at Fort Knox and the other Mint depositories drafted in between 1993 and 2008. What is worrying is that the reports now in my possession reveal the audit procedures have not competently been executed. Combine that with the fact the documents are incomplete and redacted, and the result is suspicion of fraud. In this blog post we’ll have a first critical look at the reports and the problems to be found within. For starters, allow me to expand on what I think happened at the Mint’s headquarter on the 8th floor at 801 9th Street NW Washington DC, before these documents were sent to me. It should be clear that the US Treasury (owner of the gold), US Mint (main custodian), Federal Reserve Bank Of New York (second custodian), and the Office Inspector General of the US Treasury (head auditor), are reluctant to disclose information about the audits of the gold at the four largest depositories that store over 8,000 fine metric tonnes. 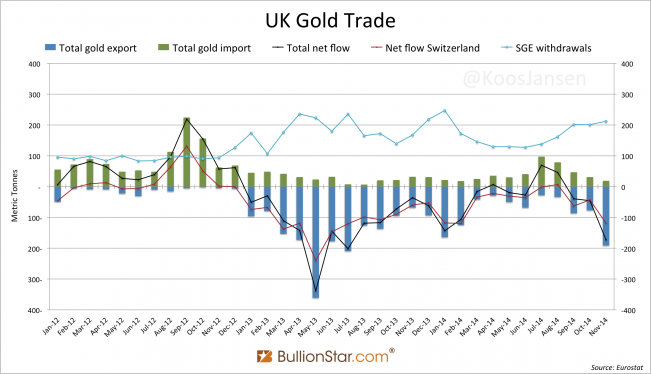 Consider that the most seasoned gold analysts aren’t even aware this gold is audited. 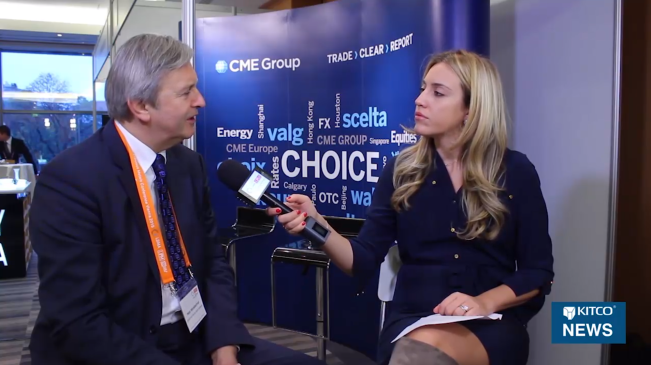 About a year ago we read in the introduction of an interview with world-renowned gold commentators Jim Rickards, “unlike many today, Jim Rickards believes the gold is indeed in Fort Knox but has not been audited to avoid drawing attention to it and to downplay its role”. More recently, on 11 February 2017 the Financial Times wrote, “much of the world’s excavated gold is thought to be in Fort Knox, but nobody can be sure, since the US government will not allow the auditors in”. No, auditing Fort Knox is not a topic only the mainstream media are confused about. Gold advocates are in the dark as well. Exhibit 0. Source. Overview of the four main depositories that store the US official gold reserves: Denver, Fort Knox, West point and the Federal Reserve Bank Of New York. Where the working stock is exactly located is not known (likely Washington DC, Philadelphia and West Point; perhaps also Denver and San Francisco). The Deep Storage gold is the metal in 42 sealed compartments spread over Denver, Fort Knox and West Point. What nobody knows is that according the US government 100 per cent of the Deep Storage gold has been audited in between 1974 and 2008 (page 4). This period can be divided in two chapters: the first runs from 1974 until 1986 when the Committee for Continuing Audit of the U.S. Government-owned Gold verified the majority of the Deep Storage metal. 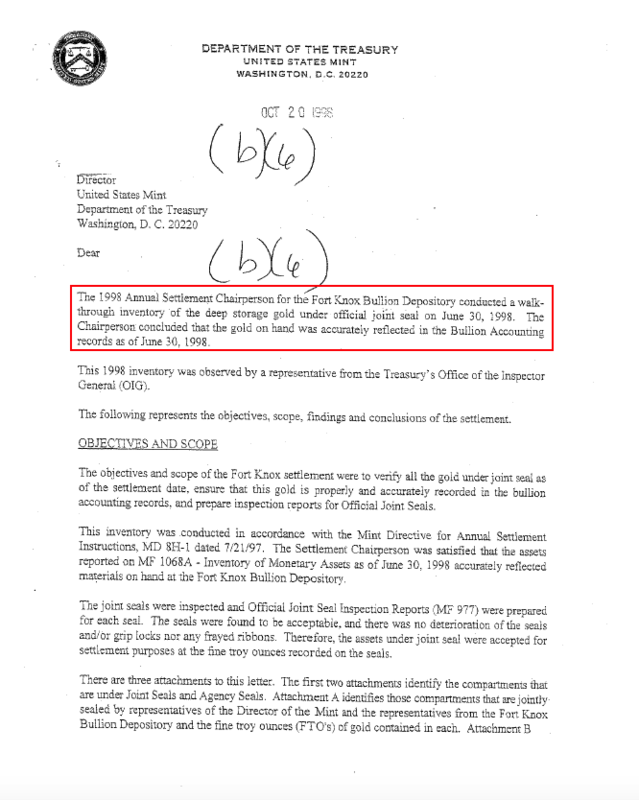 The second chapter covers 1993 until 2008 when the residual was examined under the supervision of the Office Inspector General of the US Treasury. In my previous posts on this subject we focused on the first chapter, what is written below skims the surface of the second. As promised, eventually I will publish a full in-depth analysis of all chapters (there are additional chapters in the fifties, from 1986-1993, in 2009, 2010 and 2011). Over the years my inquiries at the US government though regular channels have produced little intelligence about the physical audits of the Deep Storage gold. Some departments cooperated at first, but eventually they stopped replying emails or just hang up the phone while I was talking. The second layer of defense was raised when I started submitting FOIAs. Instead of honoring my requests they tried to delay and dodge most appeals. Clearly, the US government prefers not to answer my questions than to flaunt with the audit results. However, in 2016 I embraced the motivation to push through and find out how many gold bars were counted, weighed and assayed in between 1993 and 2008, when allegedly the last series of physical audits was conducted. Not surprisingly, zero US government departments could provide me the information I was looking for, but through certain FOIAs I obtained leads to submit new FOIAs, and so on 12 Augustus 2016 I demanded, inter alia, the “memoranda submitted by the US Mint Director’s representative regarding audits of the Mint Schedule of Custodial Gold and Silver Reserves to the Chief Financial Officer drafted from 1993 through 2008”. The Mint replied this request would costs me $3,144.96 dollars because it would take 40 hours to search the respective documents, 8 hours for review, and additional costs would be incurred to duplicate 1,200 pages. I thought this was hogwash – 1,200 pages seemed out of proportion for such memoranda, how hard can it be to find a few pages and how did they know it were going to be 1,200 pages if they had to search 40 hours for it – but decided to start a crowdfunding campaign to collect the money. Within 24 hours the campaign was completed and late August 2016 I sent the Mint a check, in the hopes to receive the documents a.s.a.p.. After the Mint pretended the check was missing for a few weeks, they communicated on 28 September 2016 the funds had arrived and they were working to get the requested documents out to me (exhibit 1). Exhibit 1. Screenshot email form the US Mint (Jones, Lateau). My FOIA request was originally dated from 1 August 2016, but was revised on 12 August 2016. Jan Nieuwenhuijs is my real name. Months past but nothing happened. I sent several emails and called the Mint three times, but time and time again I was maintained with false excuses. Then, finally, on 23 December 2016 the Mint delivered the documents I paid for. Sort of. Instead of 1,200 pages I received 223 redacted pages that contained 68 pages of reports I didn’t ask for and 21 pages that were copied twice. Effectively, I got 134 pages related to my FOIA request. When I confronted the Mint I paid $3,144.96 dollars for a meager 134 pages they agreed the costs had been estimated to high and a refund was reasonable. Actually, they told me they never cashed the check. So, quickly I told my bank to cancel the check and ordered my crowdfunding platform to refund all my donors. As of now all donors to my crowdfunding campaign should have received their money back (if not, please write me an email, see below for my address). From the bottom of my heart I would like to thank everyone for the loan that made this operation possible1! For me a slight doubt remained if the Mint had tried to fend me off by asking a disproportionate amount of money for a few pages that I assume are alphabetically archived, or that they handled my case in all honesty. A skeptical mind would think the former. To find out I read the internal emails of the Mint employees that handled my FOIA. Those are not directly publicly available, but I was told a trick by more experienced FOIA scholars that reached out to me after I published my previous blog posts on this subject, to ask the Mint for internal emails through, what else, a Freedom Of Information Act request (exhibit 2). Exhibit 2. 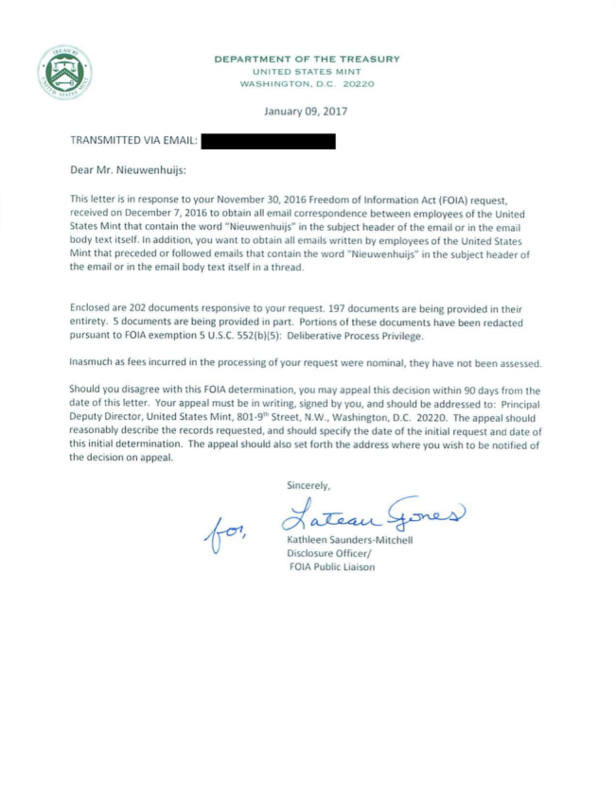 FOIA asking to obtain email correspondence written or received by Mint employees that was related to my case. And it worked! On 10 January 2017 I received all (I hope) emails from the Mint I was looking for. 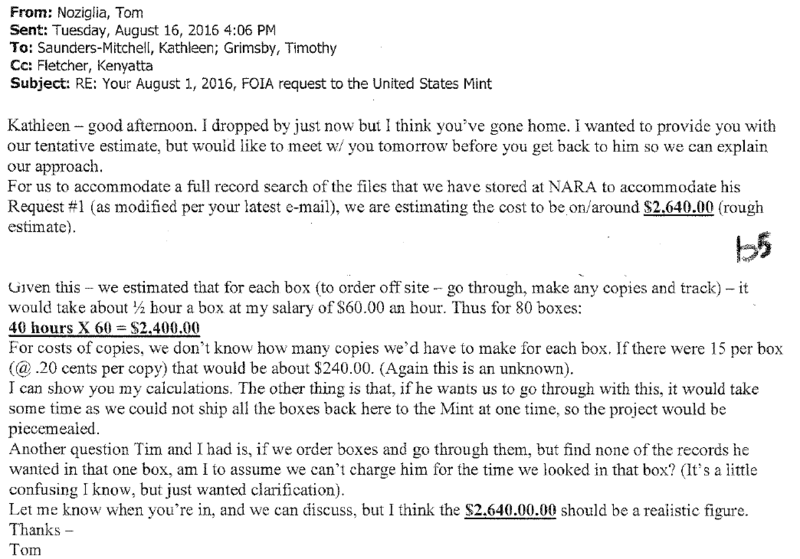 Including one wherein Audit Liaison at the United States Mint Tom Noziglia makes an estimate for the costs of my FOIA request of 12 August 2016. Read below (exhibit 3). Exhibit 3. Email by Noziglia to Saunders-Mitchell, Grimsby and Fletcher. At first sight it seems Noziglia and his office stick to prudent protocols. But possibly this email is a veil, meant to deceive me if I would ever read it. Actually, yes, I think it’s a cloak and I’ll share my theory. Exhibit 4. Screen shot LinkedIn page Tom Noziglia. Note, we can read he’s a schooled psychologist that was unemployed from 1985 until 2012 after which he started as auditor at the US Mint. I count 5 typos on this page, which suggests Noziglia is not the most meticulous auditor. 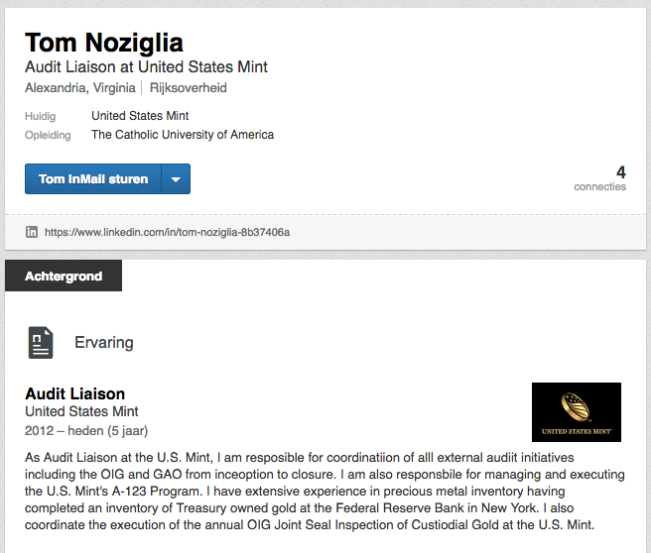 We can read from Noziglia, “as Audit Liaison at the US Mint, I [Noziglia] am responsible for the coordination of all external audit initiatives … I have extensive experience in precious metal inventory, … I … coordinate the execution of the annual OIG [Office Inspector General] Joint Seal Inspection of the Custodial Gold at the US Mint”. 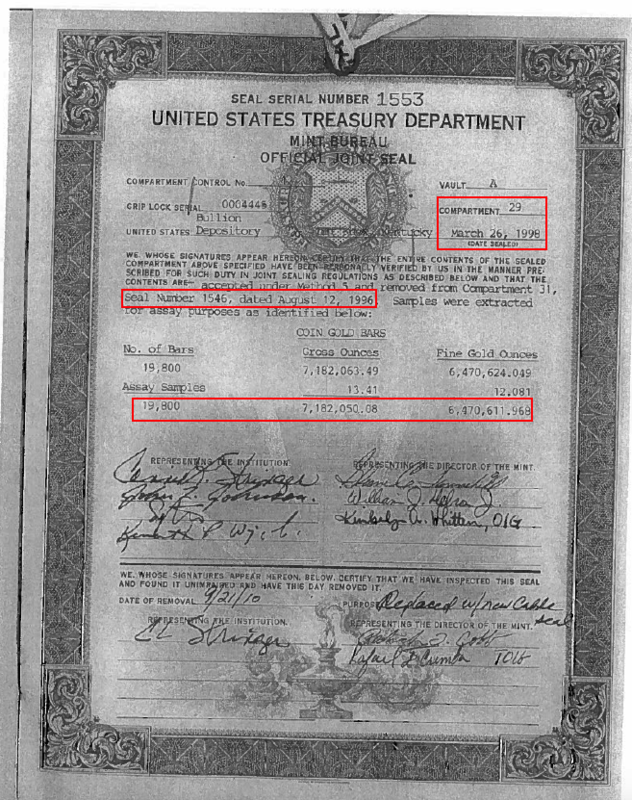 This page tells us Noziglia is one of the auditors of the US official gold reserves. So, the email above (exhibit 3) was written by the auditor who was involved in the procedures of which I requested the documentation. Noziglia must have known my inquiry could be simply honored by sending just a few pages of documentation, as he was a co-author of the documents in question. Firstly, with the benefit of hindsight we know Noziglia was lying in his email because by now I have the documents that count only 134 pages, and he was the coordinator of the annual inspections of custodial gold at the Mint. He must have known there were no “1,200 pages in 80 boxes” and so his $2640.00 dollar estimate is a hoax. 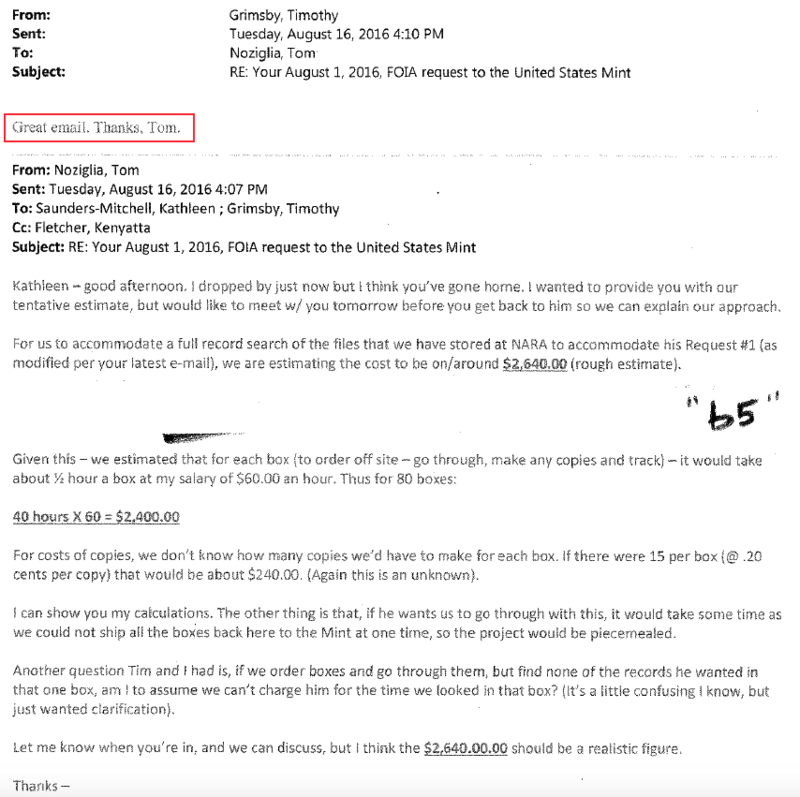 I think Noziglia wrote the email expecting I would NOT pay the ludicrous amount of dollars, but possibly DID submit a new FOIA to view the Mint’s internal emails. Chances are slim someone could pay $3,144.96 dollars right? But I’m not the first who submits an additional FOIA to obtain internal emails. Hundreds of people went before me, this is a well-known trick for FOIA pundits, and many public servants in the US must be aware of this hazard. Hence I reckon public servants consciously write emails to colleagues, as if these will be publicly released some day. I’ve come to understand submitting and answering FOIAs is nothing but a cat and mouse game. Second, the Mint never cashed the check. If they really thought they would have to search 40 hours, why not cash the check immediately and get busy? I guess they knew very well there was no searching required. Third, in case Noziglia had never seen a “memoranda submitted by the US Mint Director’s representative regarding audits of the Mint Schedule of Custodial Gold and Silver Reserves to the Chief Financial Officer”, which is not likely but let’s give him the benefit of the doubt, he could have viewed the most recent version at his office that wasn’t sent to the National Archives (NARA) yet. By doing so he would have learned very effectively these annual memoranda count only a few pages. Fourth, Noziglia states in his email (exhibit 3) he’s not sure if he will find the documents at all. 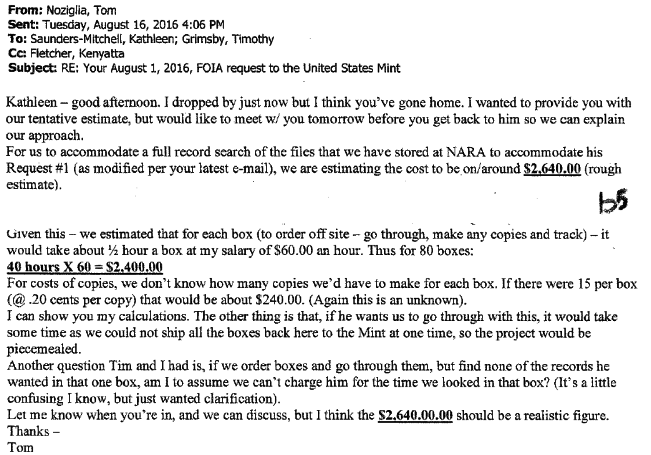 But this is impossible because he’s a dedicated Mint auditor so he must know what documents the Mint sends to NARA every year. In addition, there was no need for Noziglia to “order off site” boxes, because he simply could have commanded NARA staff to deliver specific documents – this is common practice. Fifth, in the CC of Noziglia’s email is Kenyatta Fletcher, who is the Chief of the Accounting Division of the Mint. If, which is a big if, Noziglia didn’t know what I was looking for, Fletcher would’ve known these documents wouldn’t count 1,200 pages. But still I was charged a laughable $3,144.96 dollars. Sixth, Noziglia’s estimate is $2.640.00 dollars, but I have no emails that clarify why $504.96 dollars were added for a total of $3,144.96 dollars I was charged. This indicates, Mint staff communicated in person or through phone calls to finalize my request, and so could have done likewise to handle it in general. Concluding, Noziglia’s email doesn’t paint the full picture of the internel communication. Seventh, please read what Noziglia’s colleague Grimsby replied to him after 4 minutes. Exhibit 5. Email by Grimsby to Noziglia. “Great email”? 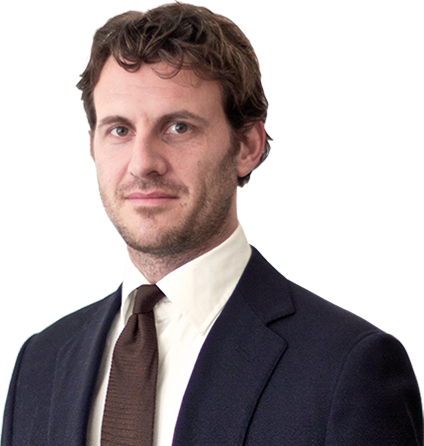 Why would Grimsby praise Noziglia for his email? If Grimsby would have written,“I agree”, I can understand. But, “great email”? Perhaps Grimsby meant to write, “great calculation that makes no sense, but is likely deceive an ignorant FOIA requester if he would ever read it!”? It sure looks like it. My guess is that Noziglia, Grimsby and Saunders-Mitchell met in the hallway in the afternoon of 15 August 2016 and agreed for Noziglia to write a phony email that arrives at an amount of dollars aimed to scare me off. 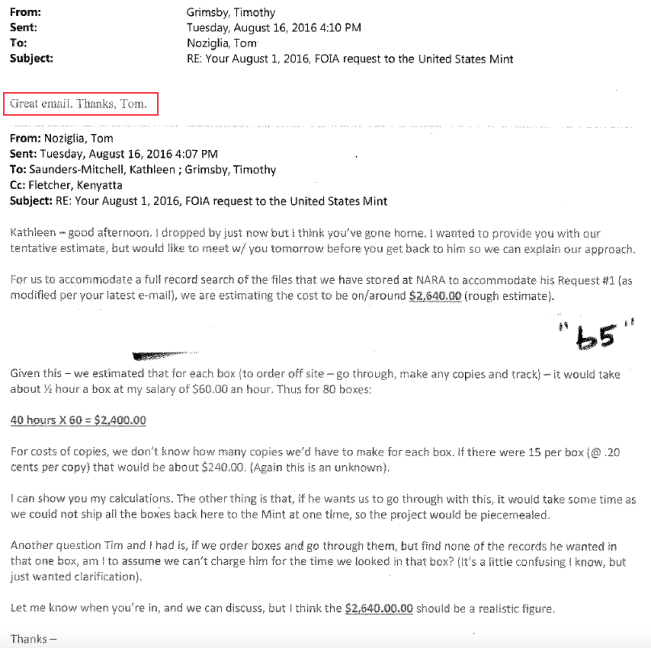 In the email below you can read Noziglia suggested to Grimsby to discuss in person in the afternoon of 15 August 2016 the estimate for the costs. Exhibit 5.2. Email by Noziglia to Grimsby 15 August 2016. 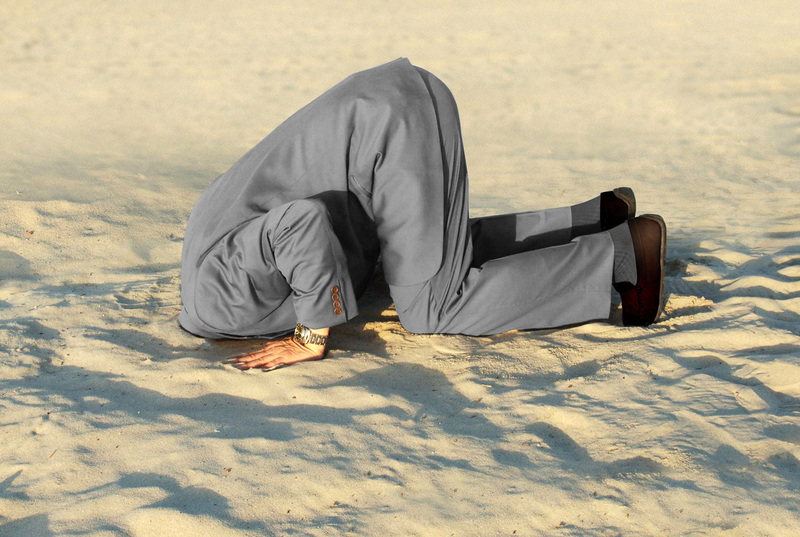 So far we’re confirmed, again, that the US gold is held in secrecy. No surprises there. Moving on to the content of the documents. When one walks into a US Mint repository the main barrier will be the door to the vault room. In the case of Fort Knox this a 20-tonne door of which no one person is entrusted with the combination. Once inside the vault room the gold is stored in segregated compartments that are sealed since at least the fifties. The official narrative is that by 2008 the load of all 42 compartments had been physically audited. 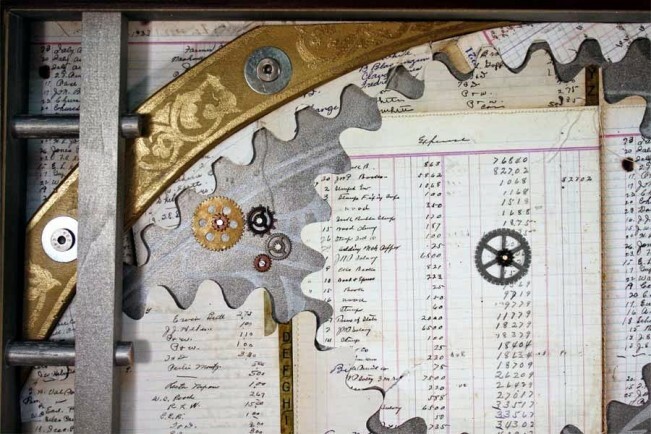 Every compartment had been opened, the gold inside counted, weighed and assayed, after which the gold was stacked in an adjacent compartment in the vault room (in several documents it’s described this is the way the gold is physically audited). 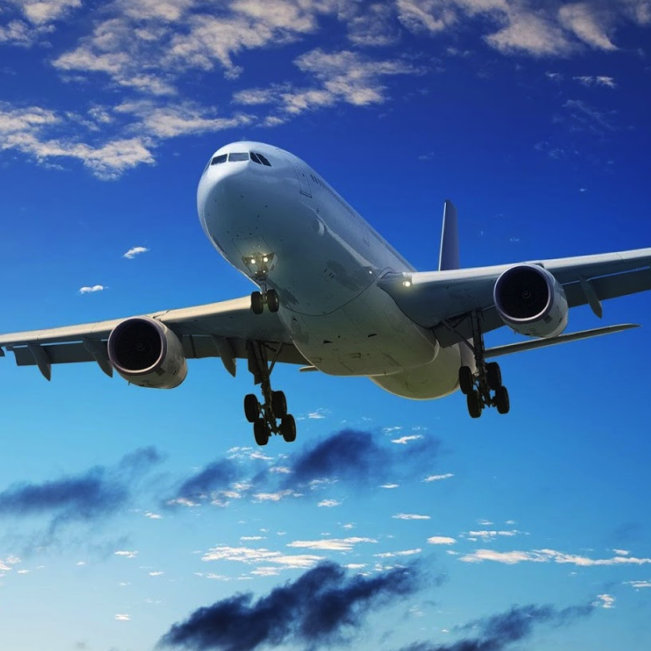 Subsequently the target compartment door was closed and placed under Official Joint Seal, if during the verification no discrepancies had been found with the Mint’s bullion ledger. In most years until 2008 one or two compartments were opened for a physical bar examination, while the other compartments were merely inspected for any tampering of the Official Joint Seal (OJS). The purpose of joint seals is to avoid the necessity of verifying all assets in each annual audit. Exhibit 6. Official Joint Seal protocol drafted in 1975. 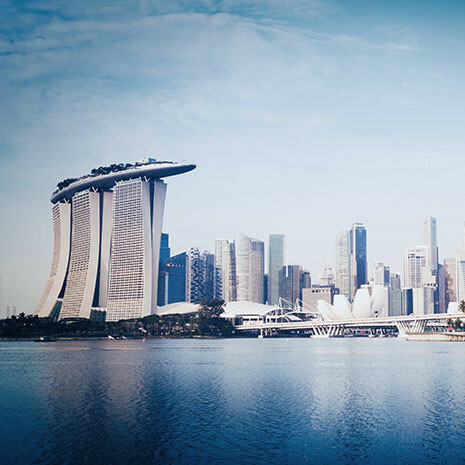 Thus the audits of the Deep Storage gold consist of two conventions: gold verifications, which are the physical audits of gold bars inside the compartments. And OJS inspections, which are checks of the seals placed on the compartment doors. The superintendent in the audit procedures is the Office Inspector General of the US Treasury, in short, the OIG. When reading the audit documents delivered to me (the Memoranda hereafter) the distinction between gold verifications and OJS inspections is clear. Let me show you an example of Fort Knox. The first screen shots below are from a gold verification at Fort Knox in March 1998. Exhibit 7.1. Gold verification at Fort Knox March 1998, page 1. Exhibit 7.2. Gold verification at Fort Knox March 1998, page 2. Exhibit 7.3. Gold verification at Fort Knox March 1998, page 3. The following screen shots are from the OJS inspection at Fort Knox in June 1998. We conclude gold verifications and OJS inspections are performed separately and thus are reported as such. Exhibit 8.1. OJS inspection at Fort Knox June 1998, page 1. Exhibit 8.2. OJS inspection at Fort Knox June 1998, page 2. Exhibit 8.3. OJS inspection at Fort Knox June 1998, page 3. Exhibit 8.4. OJS inspection at Fort Knox June 1998, page 4. Click here and here to download all Memoranda sent to me by the US Mint. After I had organized the documents and imported all data in spreadsheets I noted the 134 pages exclude 27 OJS inspection reports and at least 3 gold verification reports. I’ve asked the Mint to deliver the missing Memoranda, although I’m not expecting them to ever comply. The fact 30 Memoranda are missing is of course highly problematic. Bear in mind, I offered the Mint $3,144.96 dollars to produce these documents. Exhibit 9. Overview gold verification and OJS inspection reports Deep Storage gold. Note, throughout time the Memoranda format changed, so in some years one Memorandum included both gold verification and OJS inspection paragraphs. In case you’re wondering how I know what gold verifications reports I’m missing, this is because references are made to these physical audits in succeeding gold verification reports. Fort OJS inspection reports, those should be done every year. Below is an example of an Official Joint Seal. I obtained nearly all OJS copies from a separated FOIA request at the OIG. Exhibit 10. OJS Fort Knox compartment 29. There are a couple of disturbing lines written in the Fort Knox OJS inspection report of 1996. Although for an OJS inspection seals should only be examined for tampering, on 12 August 1996 at the Fort Knox OJS inspection two representatives of the General Accounting Office (GAO) showed up in the vault room and decided to select “a single joint sealed compartment for opening and inspection”. Exhibit 10. 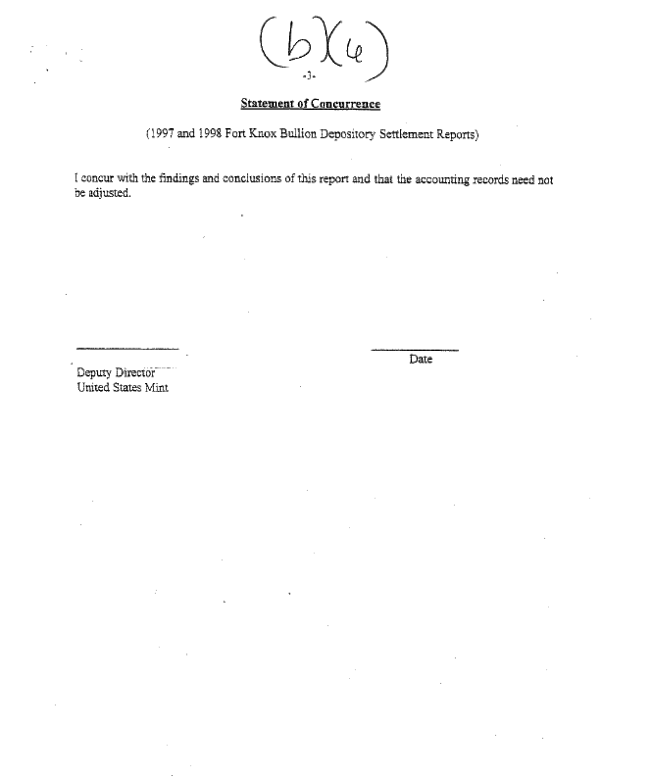 Fort Knox OJS inspection report 1996. Unfortunately the report doesn’t say what was in the vault compartment; how many bars and fine troy ounces (FTO) it contained. Based purely on this document it would impossible to decipher what the GAO exactly did. However, by combining the info in the 1996 OJS inspection report with documentation obtained through a FOIA requests at the OIG, we do know what happened. Have another look at exhibit 10. We can read Fort Knox compartment 29 was sealed in 1998. But the content, 19,800 gold bars weighing 6,470,624.049 FTOs before assays samples were taken, was sourced from compartment 31 that was sealed on 12 August 1996. Was compartment 31 the one opened by the GAO in 1996? Yes, without a doubt. 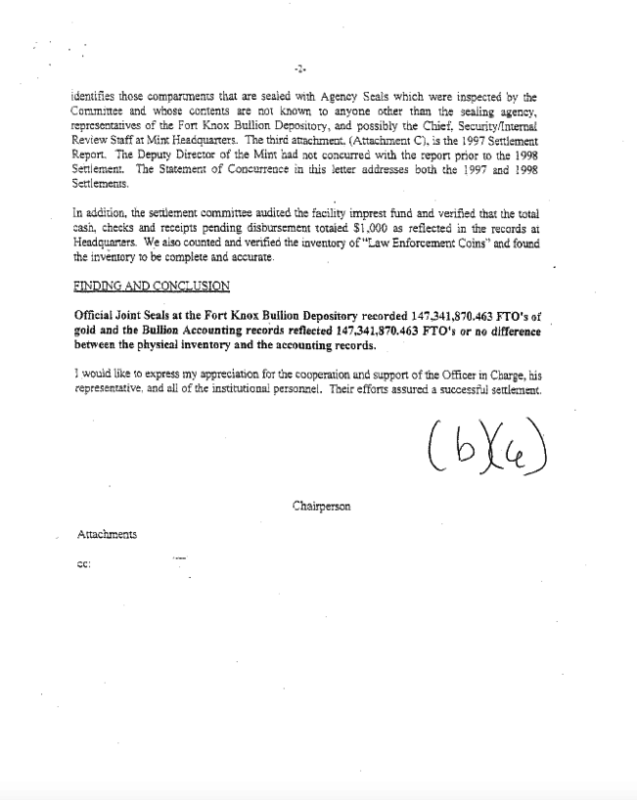 By examining all OJS copies – such as demonstrated in exhibit 10 – it shows there was no other vault segment freshly sealed on 12 August 1996 other than compartment 31. Moreover, the 1996 OJS inspection report mentions only one joint sealed compartment was breached. Therefore we know the GAO representatives opened Fort Knox compartment 31 comprising 19,800 gold bars weighing 6,470,624.049 FTOs on 12 August 1996. Furthermore, in the 1995 OJS inspection report we read there was one compartment – the number is redacted – that contained 19,800 gold bars weighing 6,470,624.049 FTOs. And in 1995, 1996 and 1997 there were no gold verifications at Fort Knox as far as I know, other than the GAO incident. Have a look below at a screenshot from the 1995 Fort Knox OJS inspection report. Exhibit 11. Fort Knox OJS report 1995. What happened is that on 12 August 1996 compartment 31 was opened by the GAO to “check a few bars”, but then two years later in 1998 the same gold was verified by the OIG; all the gold inside taken out of compartment 31, counted, weighed and assayed, to be stored across the hall in compartment 29. This is suspicious. I quote, “the purpose of joint seals is to avoid the necessity of verifying all assets in each annual audit”. I do not possess the official rules for US Mint OJS inspection and gold verification for the year 1996 (“MD 8H-1”), but based on the rules that prevailed in 1975, what the GAO did on 12 August 1996 was not done. Read with me. My interpretation of the quote above is that if a compartment was opened all assets within should have been verified by the auditors, not just a few bars. If these rules still applied in 1996, what happened in Fort Knox compartment 31 was fraud. Unfortunately, but perhaps no coincidence, the GAO is exempt from FOIAs. On their website we read, “the Government Accountability Office (GAO) is not subject to the Freedom of Information Act”. (In July 7, 2004, the US GAO’s legal name was changed from the General Accounting Office to the Government Accountability Office.) I’ve submitted a FOIA at the Mint to obtain MD 8H-3 but it bounced. Currently I’m trying the OIG to provide these rules. How come the GAO could open a compartment? 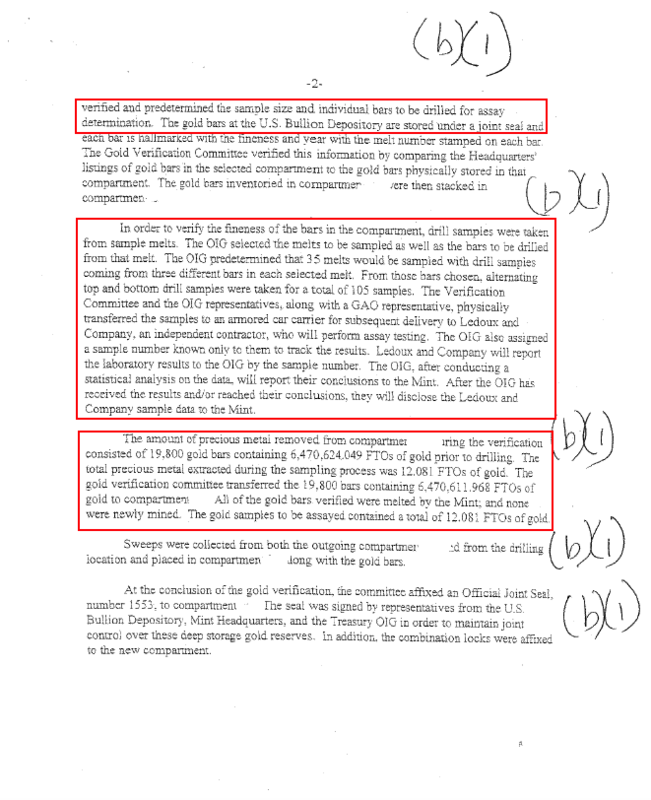 The OIG stated under oath in 2011, “since 1993, when we assumed responsibility for the audit, my office has continued to directly observe the inventory and test the gold” (page 4). If the OIG is responsible how come the GAO could break a seal? 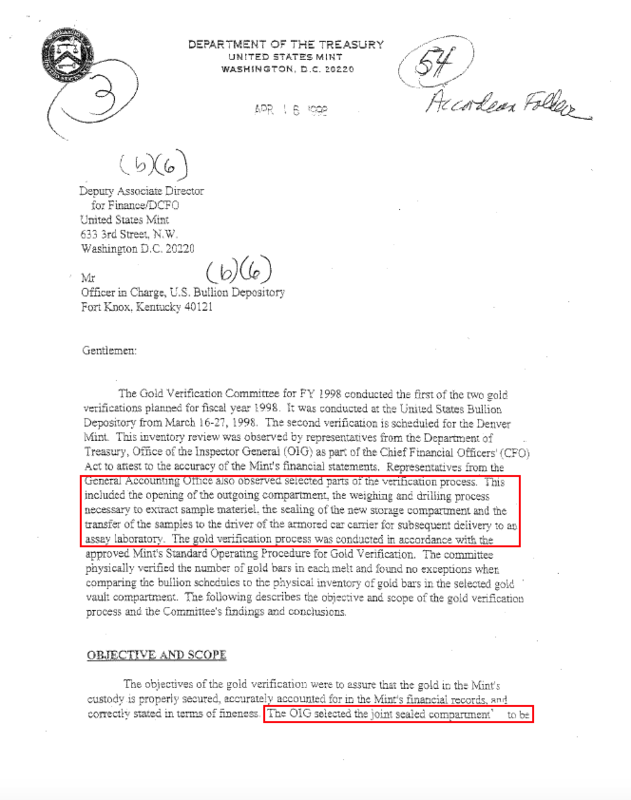 Let’s contemplate this: if the “random checks” the GAO performed in 1996 in compartment 31 formed an adequate gold verification, why did the OIG re-audit the exact same gold in 1998? And what was the intention of the GAO in 1996? 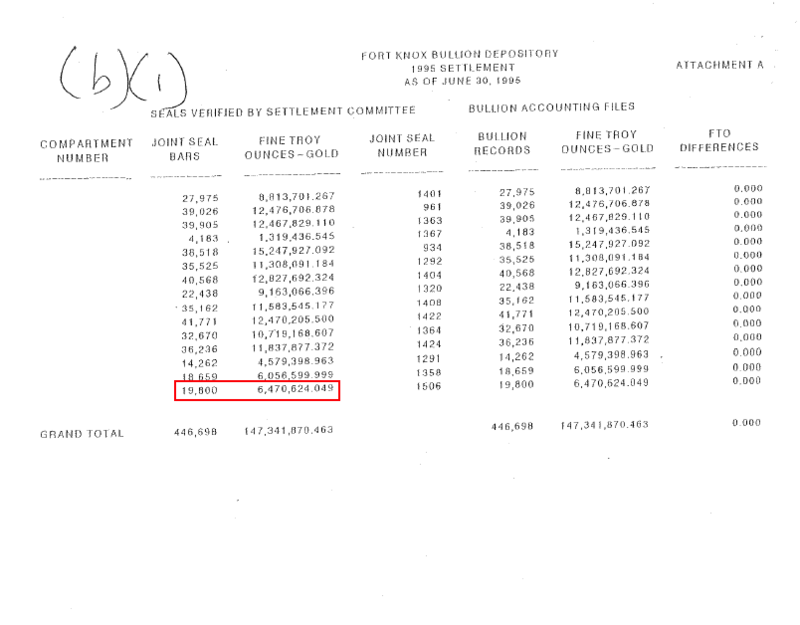 The GAO couldn’t fully audit compartment 31, because they were present at Fort Knox only for one day (12 August), and no single person or flock of auditors can verify 19,800 large gold bars in one day. 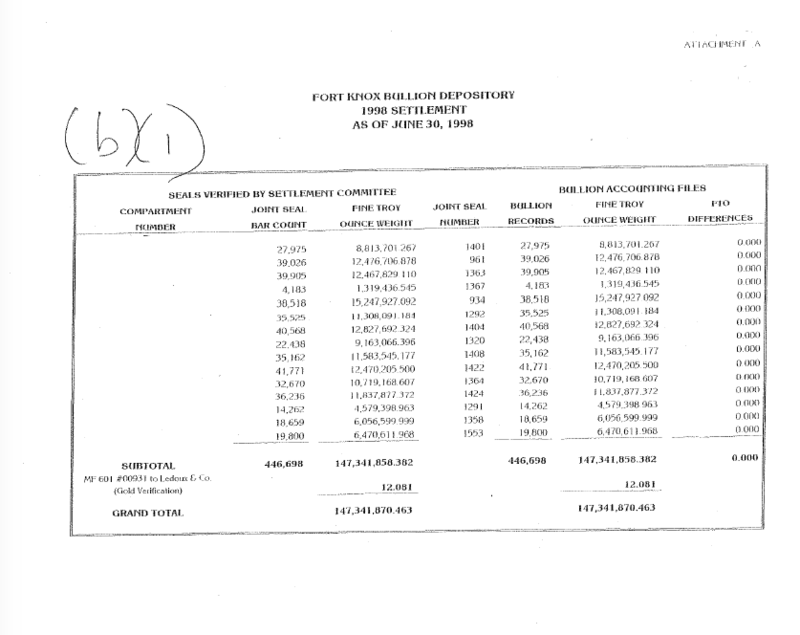 The fact these 19,800 gold bars were re-audited in 1998 underlines what the GAO did in 1996 was inappropriate at best. One theory is that the gold in compartment 31 was prepared in 1996 to be physically audited down the road. 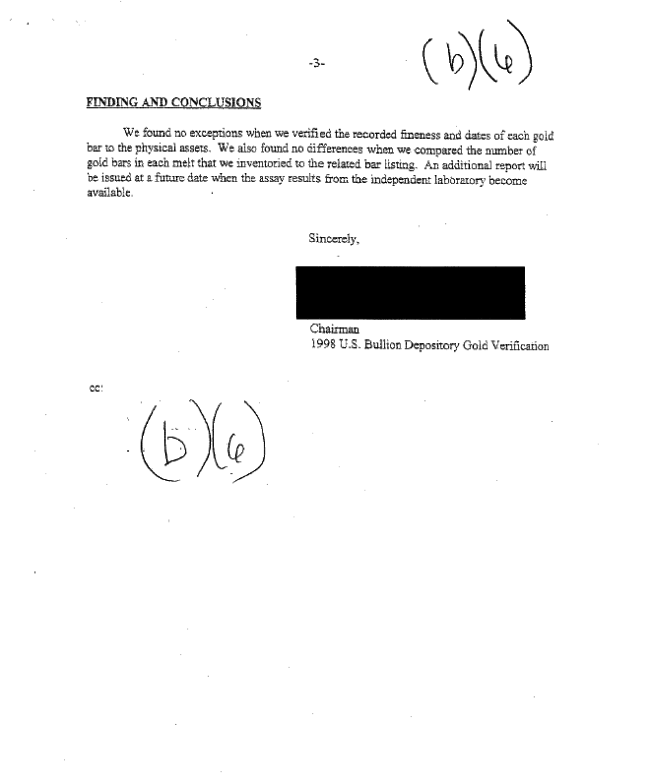 Remember what the Fort Knox gold verification report of 1998 stated (exhibit 7.2)? In 1998 the OIG, “selected predetermined individual bars to be drilled for assay”. 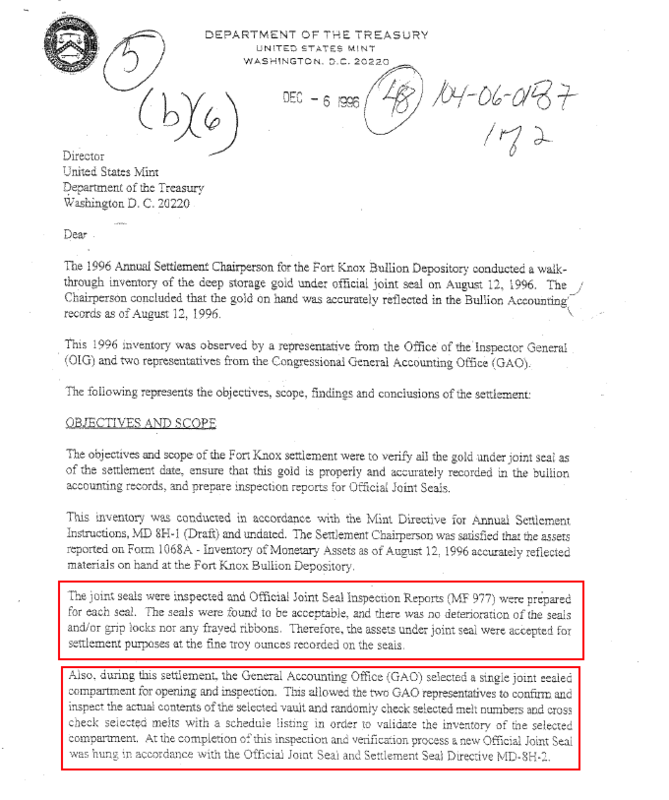 Possibly, the OIG selected the exact bars in 1998 that were put in in 1996. If this is true the names and autographs of the perpetrators of this crime are on the seal of compartment 29 (exhibit 10). My succeeding post on this subject will expose that many other Deep Storage compartments at the Mint have been opened for dubious reasons as well. Which could be the reason the Mint didn’t provide us ALL the OJS inspection reports from Denver and West Point from 1993 through 2003 (exhibit 9). We need to discuss the sample size of the gold verifications. 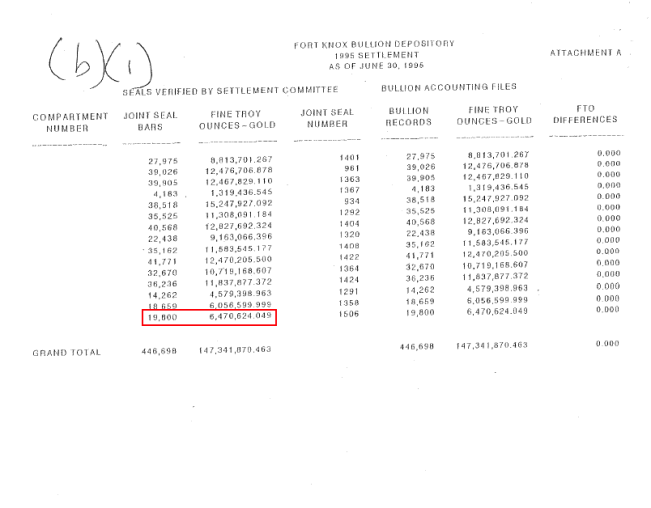 In 1998 at Fort Knox 19,800 gold bars were inspected but only 105 of them were weighed and assayed (exhibit 7.2). That’s not much in my humble opinion. In any case, I expected a higher sample size. In the 1953 audit at Fort Knox (download report here) in total 88,000 bars weighing 48,506,985 FTOs were counted for verification. About 10 % of those were weighed. 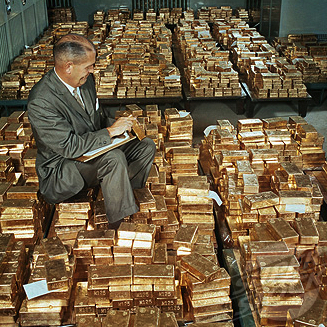 During the Continuing Audits from 1974 through 1986 it seems 2 % of the gold counted was weighed. A huge decline from 1953. Exhibit 13. 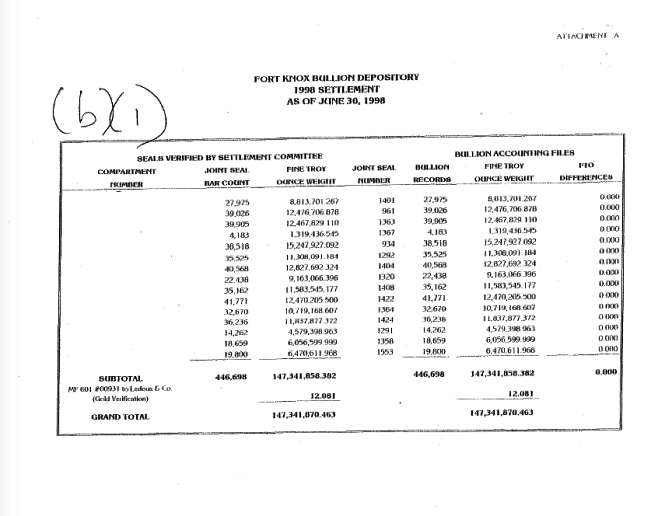 Audit report Fort Knox 1981. Although gold bars tested to be out of tolerance during a Fort Knox audit in 1977 at a sample size of 2 %, by 1998 the sample size had been further debased to 0.53 %. I’m not a professional auditor (if you are one please contact me), but common sense suggests that when irregularities are found the sample size should be increased, not decreased. To make matters worse, in 1999 at West Point the sample size was 0.52 %, and again, a melt appeared to be out of tolerance. Exhibit 14. Gold verification report West Point 1999. Was the sample size increased after 1999? Not really. At Fort Knox in July 2000 the samples size was 0.65 % (93 bars weighed of 14,262 bars counted). But wait until I show you what numbnuts were entrusted handling the scale for the audits of the world’s greatest gold hoard. Exhibit 15.1. Gold verification report West Point 2004. Exhibit 15.2. Gold verification report West Point 2004. When all parties tried to reconcile the weight of samples on 22 and 23 July 2004, they found out, “the scale was reading at ounces rather than fine troy ounces”, because, “a setting on the scale had not been properly changed”. Allegedly this is what caused alternative readings in the books of the Director of the Mint’s Representative and the OIG’s Representative. And presumably because nobody could figure out how to use the scale correctly they decided to postpone re-weighing the samples until 24 August 2004. This failure of how to use a scale is a colossal disaster for the credibility of the Deep Storage audit procedures. In 2004 a mere 71 bars were weighed and assayed, but it appeared that none of the auditors present knew how to rightly use the scale. 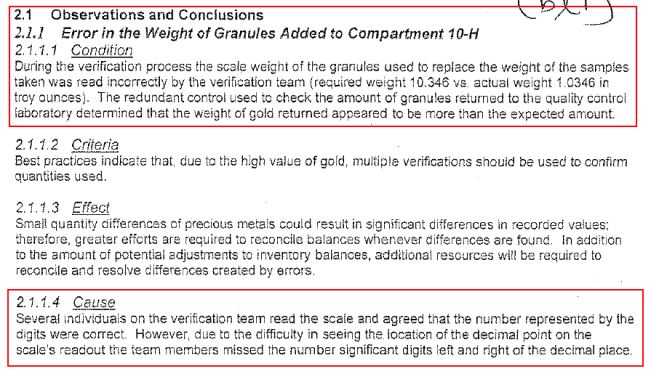 The Memoranda mentions they found out the scale wasn’t properly functioning when weighing the assay samples, but what about the weighing of the actual bars? What about the weighing of every Deep Storage gold bar under the supervision of the OIG from 1993 until 2008? We have no guarantee this has ever been executed competently. To repeat, the official explanation for this blunder reads, “the scale was reading at ounces rather than fine troy ounces”, because, “a setting on the scale had not been properly changed”. First, in my mind there can be no imaginable circumstances in which setting of the scale should have been changed. The scale should read troy ounces to as many decimals all day long. That’s it. Why change the settings? Second, they say, “the scale was reading at ounces rather than fine troy ounces”, but scales don’t read fine troy ounces so this statement is fake. 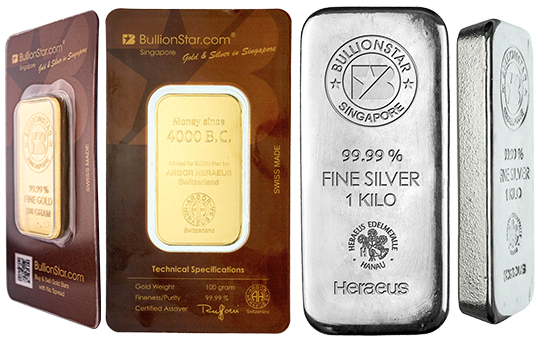 A scale reads troy ounces, or digital ones can be set to reading grams; it cannot smell what is the purity of the gold and thus display fine troy ounces. That’s what the assay test is for. Exhibit 16.1. Gold verification report West Point 2008. Exhibit 16.2. Gold verification report West Point 2008. The auditors couldn’t clearly read the decimal point. After assay samples were drilled to be taken out, the auditors weighed the same amount of gold granules to replace the samples, in order for the Deep Storage FTOs to remain flat in 2008. But the assay lab, White Sands Missile Range, which is a division of the US Army, found out from the paper work that the weight of the assay samples didn’t match the weight of the granules. And so West Point compartment 10-H had to be re-opened on 22 September 2008 to put an exact 10.346 ounces of gold in, instead of 1.0346 ounces. What a catastrophe! Be aware that before weighing the granules the auditors weighed 86 gold bars and the assay samples. How do we know they properly weighed the assay samples and the totals of the 86 bars? The short answer is, we don’t. Thereby, anybody with a sense for gold can see the difference between 10 ounces and 1 ounce of yellow metal. From the examples above it should be clear that the Deep Storage gold has not been audited by professionals, but the precious metals have been verified by imbeciles. Clearly the scale was repeatedly handled by amateurs, which throws a wrench at the integrity of the entire US official gold reserves auditing project. 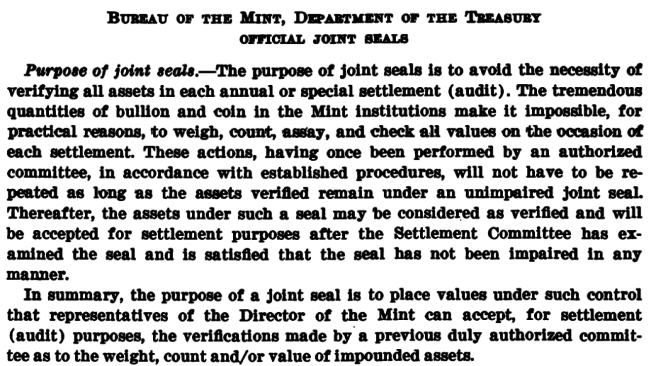 I’m not at all surprised the US Mint has tried everything to keep the records of the auditors out from the pubic domain. Fortunately most of it will be out in the open eventually. 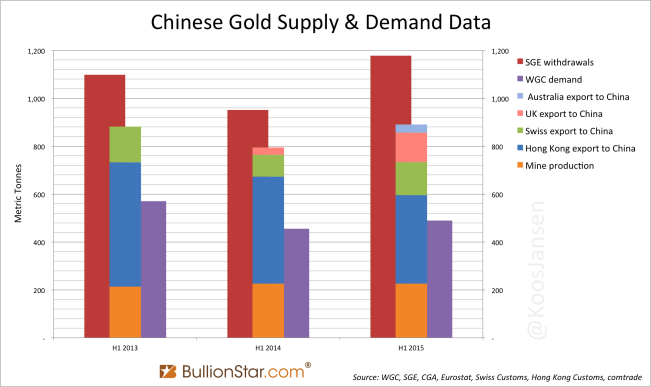 The citizenry of the world deserves to know everything there is about the Deep Storage gold. Let’s finish with one more comment from the West Point 2006 audit report. Exhibit 17.1. Gold verification report West Point 2006. The auditors couldn’t figure how to use the drill to take assay samples (how about pointing the tip to a bar and press the button). They also were oblivious how to calculate fine troy ounces. We must wonder if these people would be capable of tying their own shoelaces. In any case, the fact the US government chose to assign very inexperienced people widely opens the possibility that the audits are a complete hoax.